Today's team consisted of Colin, Headley, Bob, Kim, John, Jonathan and Richard. 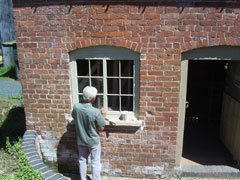 Kim completed the glazing of the last of the front windows today. This is an important milestone as this makes the mill as weatherproof as it is ever going to be. Colin and Bob were not far away from where Kim was working, but in the cool and shady interior of the mill. They spent the day working on the crown wheel and pinion that drives the sack hoist. The wooden cogs need to have their profiles adjusted to get the mesh smooth. Experimentation led to the conclusion that the best way to shape the cogs in situ is to use a chisel to shave the corners off. This leaves tool marks on the new cogs that match similar marks on some of the old cogs, so we seem to have found how the old millwrights did the same job. Checking to see which cogs needed shaping involved turning the machinery. This meant interrupting Headley who was working on the great spur gear, removing the rotten stumps of last few cogs. In spite of the enforced breaks, Headley got the last of the cogs out and the reinforcement of this gear wheel can be started. John and Jonathan built another step on the path up to the roadway. 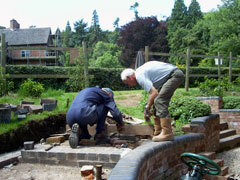 Jonathan laid the bricks under instruction from John who also did most of the labouring. Both of them found that it was a very hot day for working in the open but stuck to the task and the step was completed by close of play. Richard planned the repair of the upstream tun, the wooden box that encloses the millstones. The original is wormeaten beyond recovery, so he is going to have to construct a copy from new timber.